Greg Oden is looking at Dallas, Miami, San Antonio, and Cleveland as potential landing spots for his NBA comeback. But that's not the real Greg Oden news that's out there today. Turns out he's a Belieber! 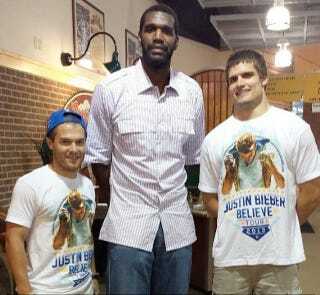 Several fans spotted Oden at last night's Justin Bieber show in Oden's hometown of Indianapolis. He looks positively thrilled, doesn't he? Like Sidney Crosby, we had no idea Oden was such a swaggy bro.